Each year, roughly 4000 Canadians die by suicide. Not only are these losses tragic, but each individual who dies by suicide was no doubt connected to a community of people who will experience complex grief. There are family members, colleagues, and friends who are left to sort through intense feelings, sometimes of helplessness, guilt, or pain. 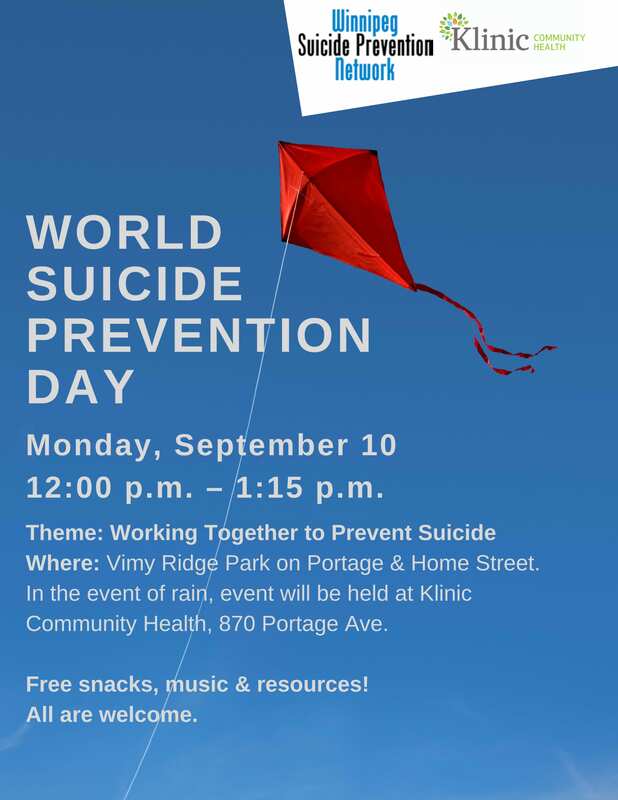 The Winnipeg Suicide Prevention Network (WSPN) recognizes that communities like RRC have an important role to play in both preventing suicide and supporting individual and collective healing; we agree. Laureen Janzen (Manager of Counselling and Accessibility Services) and Breanna Sawatzky (Mental Health Coordinator), are WSPN members and have been helping to plan World Suicide Prevention Day 2018. There will be a free public event over the noon hour on September 10th. As part of the Healthy Minds Healthy College initiative at RRC, we would like to invite staff, students, and faculty to join us in observing this important day. This year’s theme is “Working Together To Prevent Suicide.” Please contact Breanna if you are interested in attending with the RRC group. The event is about an hour in length and is open to all in the community.